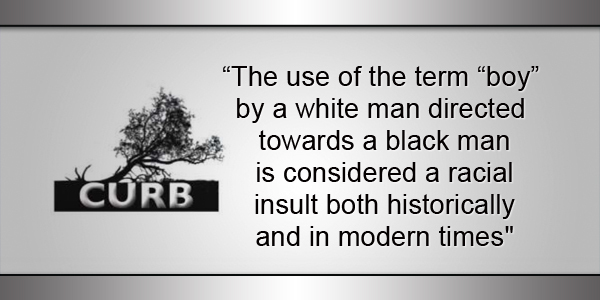 A statement from Citizens Uprooting Racism in Bermuda spokesperson said, “The use of the term “boy” by a white man directed towards a black man is considered a racial insult both historically and in modern times. “In Africa the term “boy” was used as an insult towards black men and slaves by the colonizers. Blacks were viewed across all domains as being physically, intellectually and spiritually inferior to whites and was purposefully used to demean, demoralize and emasculate people of colour. “In the United States during slavery and the Jim Crow era the term was used against black men and slaves by white racists bent on asserting their white supremacy over black bodies. “In the colonies where Black men, women and children were sold as chattel, it was used to control, threaten and intimidate. In order to survive black men were forced to mask their masculinity and become invisible. “During the Jim Crow era, the mantra “I Am a Man” became a declaration of civil rights and was coined in direct response to the term “boy” and the process of emasculation. There can be no doubt about the words connotations. “With an even earlier history of slavery and segregation than the United States the term “boy” in Bermuda was also used historically as a racial epithet for the very same reasons. Therefore the use of the term “boy” by a white man, purposely directed towards a black man in a public space carries a great deal of weight, all of it racial. “This leads us to the way the term “boy” was used in the House of Assembly last Friday. That it was taken as a racial epithet by Minister Diallo Rabain is unquestioned and was deeply offensive. “That MP Trevor Moniz, a lawyer supposedly understanding what constitutes a racial epithet, used the term against Mr. Rabain shows his deep sense of privilege that he could do so without recourse. “No doubt there will be the usual discussion about ‘intent’ but the use of the word has had an extremely negative impact, not only towards Mr. Rabain but also to many Black Bermudians if one is to go by the social media explosion that has followed this exchange. “The U.S. Supreme Court “ruled on an appeal… that the use of the word ‘boy’ on its own is not enough evidence of racial animus, but that the word is also not benign.” That means the court is willing to consider the context in which “boy” is used to determine if it’s being uttered as a racial epithet. “Noticeably Bermuda’s Human Rights Act also talks about using words in a public place that can incite or promote ill will or hostility against that section [of the public] on grounds of colour. No doubt the Hansard Report of this incident will be studied closely. “Already the debate is rife on social media with calls of “he said” “she said” and comparisons to other examples of past disrespect, discourtesy and downright rudeness and bad language being displayed on the House of Assembly floor by both sides, as if these previous examples can wipe clean the slate of what was said in the House last Friday.